Below you fill find all funeral homes and cemeteries in or near Cadiz. Suburbs of Cadiz: Blue Spring, Blue Water Estates, Canton, Donaldson, Golden Pond, Ironton, Linton, Maggie, Maple Grove, Montgomery, Roaring Spring, Rockcastle, Trigg Furnace. Cadiz is also known as: Trigg County / Cadiz city. Their current mayor is Mayor Craig Latimer. Zip codes in the city: 42211. Our family owned and operated funeral home was established in 1963 by James Blalock and James Coleman as Blalock-Coleman Funeral Home. This partnership continued into the 1970s until the health of James Blalock caused his retirement. Some of the notable people born here have been: Stanley H. Humphries (farmer and teacher). Cadiz (local /ˈkeɪdɪz/) is a home rule-class city in and the county seat of Trigg County, Kentucky, United States. The population was 2,373 at the 2000 census. It is part of the Clarksville metropolitan area.Cadiz is an old town located close to the Land Between the Lakes, a popular recreation area, and was a base of Union and Confederate operations during the Civil War. It permits the sale of alcoholic beverages. 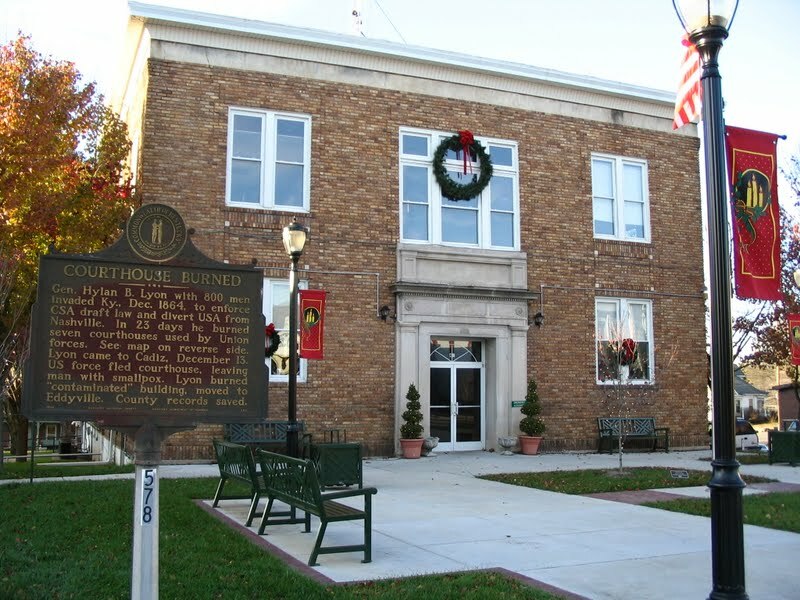 It was noted on December 21st, 2018 that Harold August Albright died in Cadiz, Kentucky. Albright was 91 years old. Send flowers to express your sorrow and honor Harold August's life. It was written by Peoria Journal Star on April 3rd, 2018 that Sarah M Kirby (Joiner) died in Peoria, Illinois. Ms. Kirby was 76 years old and was born in Cadiz, KY. Send flowers to share your condolences and honor Sarah M's life. It was noted on February 8th, 2018 that Jennifer Louise miss Key perished in Cadiz, Kentucky. Send flowers to express your sorrow and honor Jennifer Louise miss's life. It was written on October 28th, 2017 that Birdie Mae Hopewell (Greenwade) died in Elyria, Ohio. Ms. Hopewell was 86 years old and was born in Cadiz, KY. Send flowers to express your sympathy and honor Birdie Mae's life. It was noted on March 7th, 2016 that Martha White perished in Cadiz, Kentucky. White was 78 years old. Send flowers to express your sorrow and honor Martha's life. It was disclosed by Ashland Times Gazette on February 23rd, 2015 that Charles R White passed away in Caldwell, Ohio. White was 89 years old and was born in Cadiz, KY. Send flowers to express your sympathy and honor Charles R's life. It was revealed on February 5th, 2015 that Ricky J Nagel passed on in Cadiz, Kentucky. Nagel was 62 years old and was born in Murphysboro, IL. Send flowers to express your sorrow and honor Ricky J's life. It was noted on January 10th, 2014 that Verna Dean Appling (Wilson) perished in Lubbock, Texas. Ms. Appling was 87 years old and was born in Cadiz, KY. Send flowers to share your condolences and honor Verna Dean's life. It was noted on September 24th, 2013 that John Ed-ward Francis passed away in Cadiz, Kentucky. Francis was 76 years old. Send flowers to express your sorrow and honor John Ed-ward's life. It was written on September 16th, 2013 that Keith Fulton perished in Cadiz, Kentucky. Fulton was 87 years old. Send flowers to express your sympathy and honor Keith's life. Cadiz is a city in Trigg County, Kentucky County, Kentucky, United States. It is an old town located close to the Land Between the Lakes, a popular recreation area, and was a base of Union and Confederate operations in the American Civil War. It has become known as a tourist location, with its tourist information center located in an authentic 19th-century log cabin in its original location. The population was 2,373 at the 2000 United States Census census. It is the county seat of Trigg County, Kentucky County . The official website for the city of Cadiz is http://www.gocadiz.com. Her funeral will be at 1 p.m. Wednesday at Blalock ... one brother: Thomas R. (Mary) Jones of Cadiz, Ky.; four grandchildren: Samantha and Logan Crutcher, Cindy Walker and Hunter Ray Smith; and two great-grandchildren: Tristan Hodges and Conner Walker. King's Funeral Home, Cadiz, Kentucky provides complete funeral services to the local community. Listing all funeral homes in Cadiz, Kentucky so you can easily send flowers to any location (same day delivery) or find any funeral service. We work with local florists and flower shops to offer same day delivery. You will find budget sympathy flowers in Cadiz here. Our funeral flowers are cheap in price but not in value.